Sweet Preservation was generous enough to send me a big ol’ box of peaches. My husband LOVES peaches, and although I’ve never worked with them before (they’re not my favorite) I was super-excited to make something that he would enjoy. But, what to make? Luckily, Sweet Preservation has tons of recipes and canning instructions and I was granted inspiration from their site. 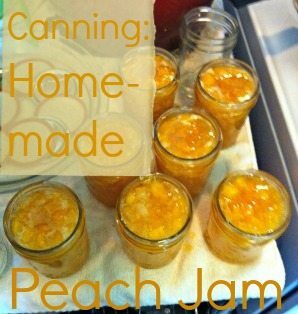 There were 10 recipes just for canning peaches! Homemade Peach Jam it is. 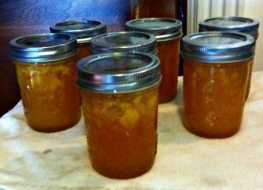 Before your hands get all sticky with peaches, prepare your canner, jars and lids. I washed everything, then set the jars in the water bath canner and filled with water to a couple inches above the jars and turned it on high to start them sterilizing. I also placed my lids in a pie plate, alternating back to front, and my rings in a small saucepan on the stove. You should also gather all the tools to fill the jars since you have to fill them pretty quickly as soon as the jam is done. I’ve got my magnetic lid lifter, my jar lifter, a ladle, and a chopstick to use to push out any air bubbles from the jars. On to the jam: First, all these peaches need peeled and pitted. I thought it was going to be a daunting task, but it actually wasn’t too bad. It goes pretty smoothly, especially once you get into a rhythm. 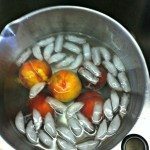 First, drop the peaches in boiling water for about a minute or two, then remove them to a sink or bowl of ice water for a minute or two. 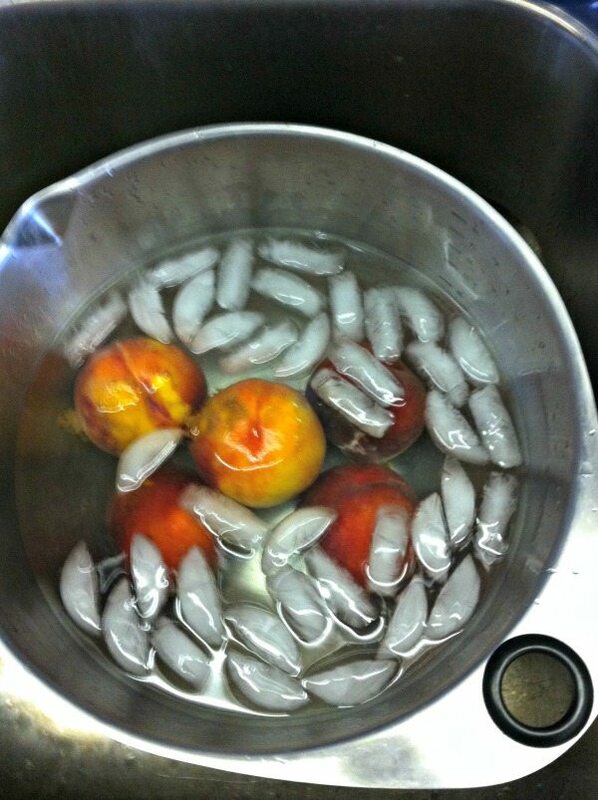 After that, the skins slip right off the peaches. Use a paring knife to help along any part that is being stubborn. Slice around the peach with it’s natural indentation (it looks like a seam going around the fruit). Gently pry the two halves apart and scoop out the pit. 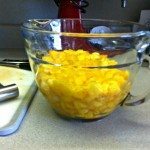 Next, finely chop the peaches, measuring 4 cups. 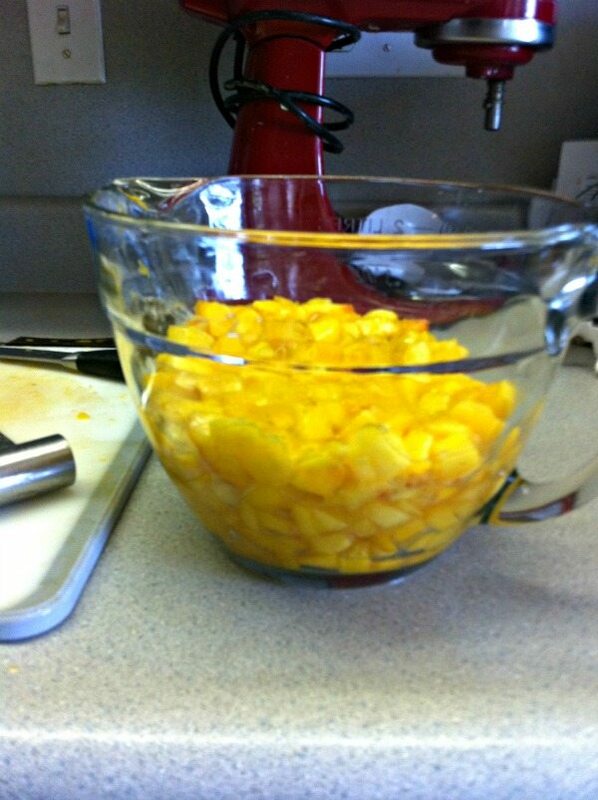 Add them to a large, heavy duty pot along with 7-1/2 cups of sugar and 4 tablespoons of lemon juice. 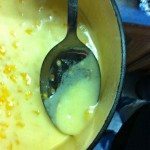 Stir it all up and heat it over high heat until it comes to a full rolling boil that cannot be stirred down. 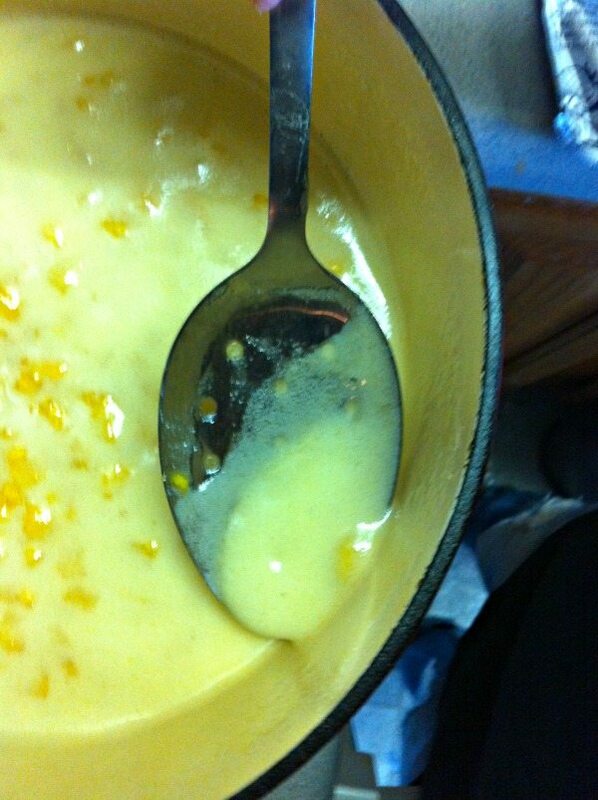 Stir in one pouch of liquid pectin, boil it hard for one minute, remove from heat and skim the foam off the top. Fill your hot, sterlized jars with the hot jam, leaving 1/4 inch headspace (image at top). Remove air bubbles and wipe the rim. Add the lid and ring, screwing it to fingertip tight. 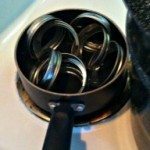 Place jars in canner and ensure they are completely covered with water. Bring to a boil and process for 10 minutes. 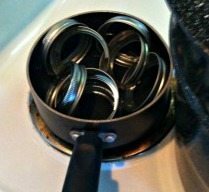 Remove canner lid, wait 5 minutes, then remove the jars, cool and store. 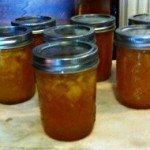 SweetPreservation.com also has recipes for apricots and cherries, and some awesome downloadable canning jar labels and ideas for throwing your own canning party! That looks delicious. We live in the fruit belt of SW MI and freeze 1-2 bushels of peaches every year for eating with brunch after church. There’s nothing better than thawing some sunshine when the snow is blowing in February. I made some preserves last winter for the first time. They were fantastic for mixing in with homemade yogurt.